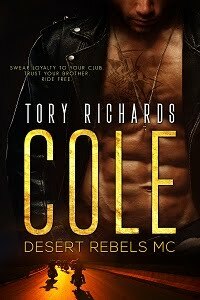 TORY RICHARDS: Meet Bess McBride! Good morning everyone! 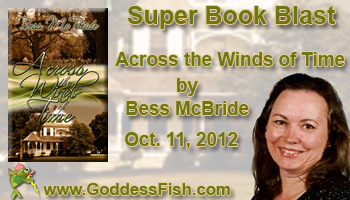 I'm hosting another author tour for Goddess Fish and today you get to meet Bess McBride. Her new book is a time travel, something I have always been interested in. I know you will give her a warm welcome. Bess McBride made her first serious writing attempt when she was 14. She shut herself up in her bedroom one summer while obsessively working on a time travel/pirate novel set in the beloved Caribbean of her youth, but she wasn't able to hammer it out on a manual typewriter (oh yeah, she's that old) before it was time to go back to school. The draft of that novel has long since disappeared, but the story is still simmering within, and she will finish the adventure one day soon. Bess was born in Aruba to American parents and lived in Venezuela until her family returned to the United States when she was 12. She couldn't fight the global travel bug within and joined the U.S. Air Force at 18 to "see the world." After 21 wonderful and fulfilling years traveling the world and gaining one beautiful daughter, she pursued her dream of finally getting a college education. With a license in mental health therapy, she worked with veterans and continues to work on behalf of veterans. 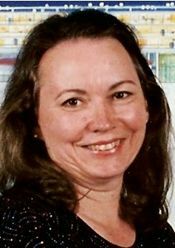 She writes romantic suspense, contemporary, light paranormal/fantasy and time travel romances and currently has eight novels published. She can be contacted through her web site at http://www.bessmcbride.com. 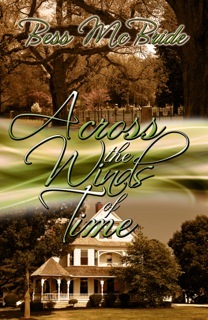 While on a genealogical research journey through the Midwest, Molly Hamilton impulsively buys a 100-year-old Victorian house in the middle of a cornfield, and falls in love with the house’s owner...the original owner, that is. Can he be a ghost? The handsome, intriguing attorney certainly feels solid—and somehow her soul knows she has always loved him. Darius Ferguson has no idea how he has come to present-day Iowa. The last thing he knew, the year was 1880, and he had just buried his fiancée, who happens to look exactly like Molly. He cannot separate the two women in his heart—to him, they are one. In spite of being drawn to him, Molly thinks Darius is unhinged. Darius wonders if he has joined his fiancée in purgatory. If time travel is possible, will love be enough to build a future together? I froze in place for a moment. It was definitely a man under the tree though I couldn’t see his face...and he knew my name. “Do I know you?” I called in an unsteady voice. It seemed, though, as if my words were taken by the wind. Who was this man? And how did he know my name? He moved away from the tree with a tentative step. His clothing was formal—a dark suit and white shirt—as if he had just been to a funeral. I hadn’t remembered seeing a canopy for a funeral on the grounds, but I wasn’t about to take my eyes off the stranger for one instant to confirm that suspicion. I thought I saw a flash of white teeth from under his dark mustache, but he was still some distance away. Golden highlights in his chestnut hair caught the sunlight, and my mouth dropped open. He was undoubtedly one of the most handsome men I had ever seen in my life. My stomach rolled over at the sight of him, though not with admiration of his good looks. Cold sweat broke out on my forehead, and I put my hand to my mouth as if to hold back the morning’s breakfast...if I’d had any. For here—in the flesh—was the man of my dreams. Not just any dreams. More specifically, my dreams of the previous evening. Yet I couldn’t for the life of me remember ever seeing him before until this moment. “Be careful what you wish for,” I muttered behind the hand that covered my face. “Molly, don’t be afraid. I can see that you are. I don’t want to frighten you.” He took another step forward and held his hands up palms out...as if to show me he wasn’t armed, I thought hysterically, or to calm me down. Either way, it wasn’t working. The author will be giving away a $25 Amazon gift card to one random commenter during the tour. This sounds like a great book. She was so lucky to be able to do such world travel as a child.